When ready to scale-up, most startups have the top and bottom of the funnels figured out. 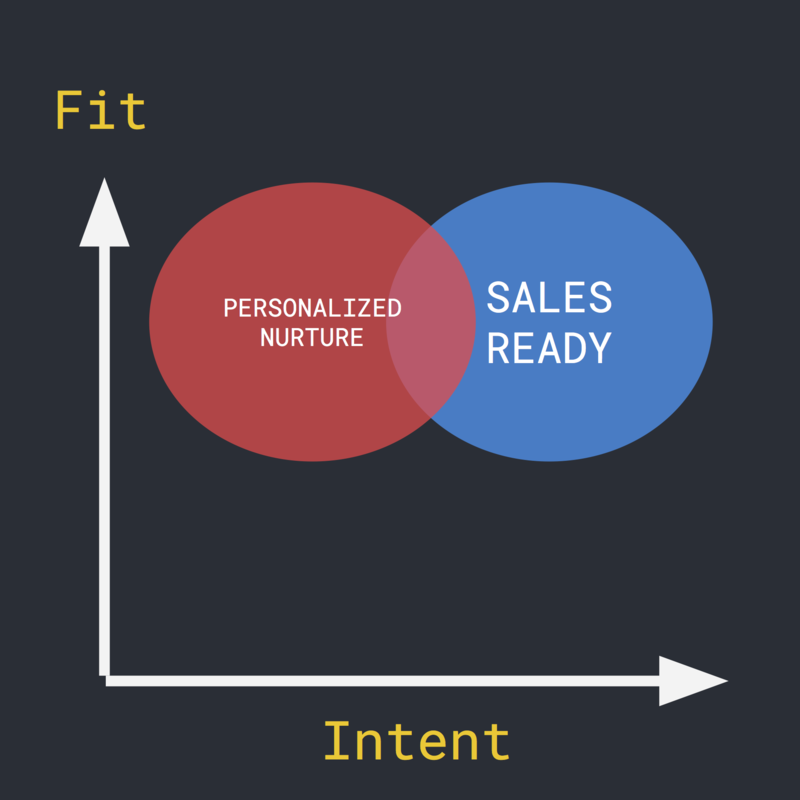 Too often, the mid-funnel (lead nurturing) is an after thought, despite having the most leverage. The top of the funnel scores all the big vanity metrics. The bottom of the funnel claims all the money. But what of the middle? Data-driven marketers move beyond generic, send-to-all spam, “enroll all” workflows, and cliche break-up emails. As we’ve written about before, marketers in scale-ups realize the mid-funnel is the only part of the funnel with both the ability to scale communication and use data to deeply personalize messages and interactions. We noticed teams who optimize their mid-funnel are able to delight sales consistently, grow predictably, and target their top of funnel acquisition efforts effectively (methodically targeting and integrating new lead sources, and creating campaigns & content). We also noticed these teams are much more advanced in their personalization strategies, which creates a better brand experience for leads and customers (than generic send-to-all spam). To make this happen, there are five tactics which work together to make lead nurturing work effectively. At some point, it became popular to focus on gated content, full screen pop-up overlays, and do whatever it takes to capture an email address. Whilst this may boost the number of leads (which feels nice), but how does this trickle down into revenue? The data-driven startups we see don’t appear to be as aggressive on email and lead capture. Whether it reduces email signups or not, what matters first and foremost is whether an account is the best-fit or not. To do this, we see startups deeply profiling their leads to see if they match their ideal customer profile. Forms are still a legitimate method to capture data. Any email signup, demo request, registration, signup, or subscription form is an opportunity to request data. Conversational forms such as Typeform or live chat tools like Intercom and Drift are another method to request more data without the feeling of friction. Typeform has a neat feature where you can link between forms between answers to progressively profile people. See this example where you can subscribe for product news from Hull. 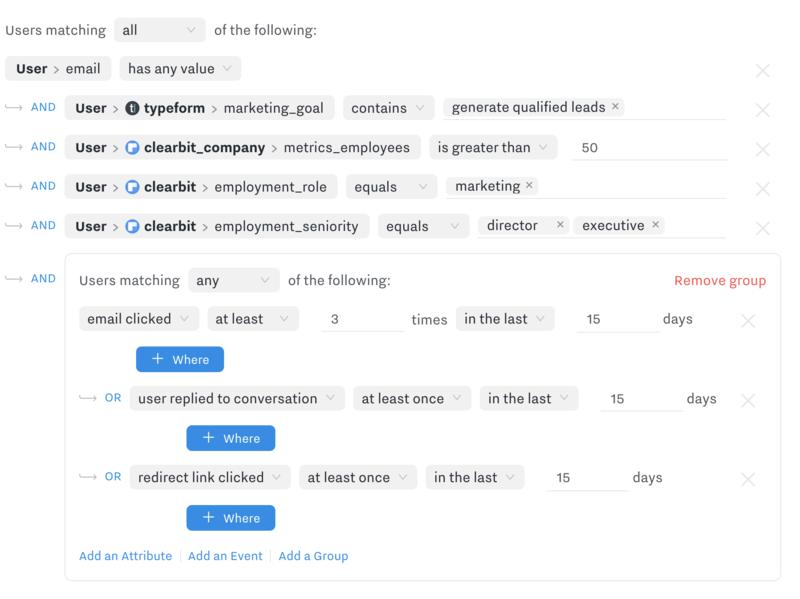 At Hull, we observe almost every customer is using enrichment services like Clearbit to fill in the blanks with key publicly available data, then using using that enrich profile to personalize content and qualify them. All this data can be used to create or update a lead profile in Hull. For instance, here’s what the Clearbit data looks like inside a Hull Profile. With a deep profile, it’s possible to filter those who are a best-fit person and company to nurture towards sales. In Hull, this is straightforward to create with a simple segment. Prior to Hull, we would get a lot of qualified leads. We'd qualify them based on different criteria, but we weren't doing a great job of capturing intent. Fit alone is not enough. You need to capture intent and engagement with your brand to understand where a lead is in the buying journey. We notice scaling startups cast more nets to capture leads. Any channel your brand is engaged in needs to track leads’ interactions there. We’ve a deep dive “Spotted” post coming soon on universal lead tracking (how you track every step of your leads journey through the buying journey). More "Spotted" playbooks like this? Subscribe to The Crow's Nest newsletter from Hull for best practices, ideas & resources for customer data management. A quick summary of common methods we’ve noticed to track engagement include the following. All this is recorded into the Hull Profile. They appear as Events in the right hand User timeline, and can be used to segment users. With Hull’s segmentation tool, you can segment events by the type, the relative or absolute timing of one or more occurences, and by event properties. Voila! We’re now able to track every lead wherever they are, then use those events to segment by engagement. Using measures of fit and intent together, you can identify best-fit leads to send to sales - these are simply qualified leads. However, you can also use this to direct your mid-funnel content strategy. Data-driven content marketers use segmentation to identify what content they ought to create and nurture leads with. Content teams can focus on these leads (and closed won customers like them), interview them, and understand what content they’d value most. I know you've got specific problems, and I've got customers like that where I can say something that can actually help you out. That's really cool because people are like "this is awesome! That's exactly our problem!" and they don't mind getting those types of emails. We notice not every team takes mid-funnel audience research as seriously as they do with SEO or PPC. The best performing teams dissect their leads list with data — use data from your ideal customer profile definitions that you’ve captured earlier (see Tactical Takeaway #1). 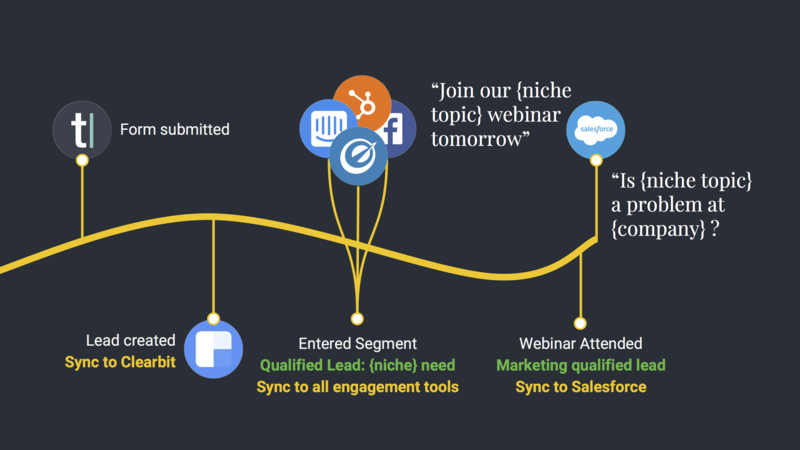 One Hull customer, Oz Content, used mid-funnel segmentation to identify a set of highly-focused niche webinars they could run, and then only invited the leads that were a best fit. The resulting email campaigns had triple the open rate of their usual lead nurturing email sends, triggered extensive email forwarding within companies - “We should all attend this webinar” — whilst sparing their existing list of leads from a semi/irrelevant offer that might have them opt-out. They become very interested. 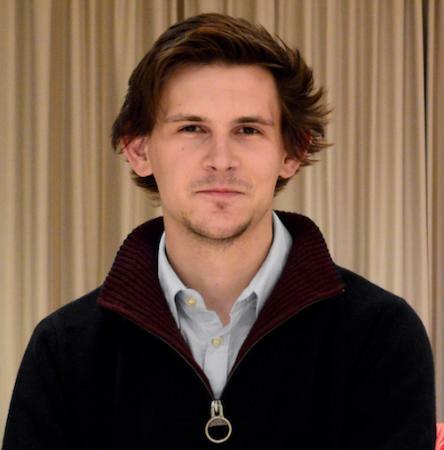 They're like "This is something where you're solving something that's really relevant. Well let me just forward this to everyone on the team" and they'll also sign up for this webinar. You have the opportunity to be produce the perfect content for your leads. Given their stage of the buying cycle, your tailored content can be far more engaging and relevant than anything else produced by anyone else (like your competitors). Only by creating mid-funnel content to match your leads, instead of the other way around can you deliver the “perfect” message to your leads at the right point in time. This enables a much deeper, more personal brand experience too. If you’re not sure what the “perfect” message for a particular lead is, then copy what other teams do (and you do elsewhere in the funnel) - research your audience! At Hull, we’re a fan of getting on a call and interviewing them 1:1. Follow our guide here on identifying customer pains and motivations. Remember, content for segments, not segments for content. This can become a regular process with reviewing lead pipeline 🔁 creating content, that continues to build a bank of content that drives conversions and sales conversations. Voila! You now have a process to develop mid-funnel content and setup successful sales conversations that your leads will love. With personalized content or not, most lead nurturing is constrained by the amount of email being sent to any one person. With email newsletters, product-trigger emails, separate product/marketing campaign emails, we see most team’s email suppression constrain the amount of engagement. Data-driven marketers supplement personal, scalable email with other scalable channels — such as ads. We’ve noticed teams syncing their email nurture workflows with ad audiences to progressively nurture leads over multiple channels. One team on Hull — an agency called EmberTribe (see their case study) — synced their HubSpot Workflows with Facebook Custom Audiences to retarget leads. They were able to maximize lead engagement by taking their nurture campaign across two channels through Hull-managed segments. Our client saw 838 new contacts in 11 weeks, with over 1700 downloads at less than $3.50 per lead. And through continued nurturing, we drove 53 sales requests, at less than $30 each. Best of all, by the time these users reached our client’s inbound marketing team, they had already become highly probable purchasers, far better than one-off cold outreach prospects. If you’re looking at running retargeting ads for B2B, take a look at what we spotted other Hull users are doing with account-based retargeting ads. Voila! You’ve now dramatically increased lead engagement with your mid-funnel content through omnichannel nurturing. When selling in B2B, you sell to a company but interact with people. It’s important to capture the context at which you’re speaking to each person. The lifecycle stage of the account is often that of the person furthest down the funnel. Someone subscribers and becomes a lead? The company is a lead. Someone completes the first payment? The company becomes a customer. Some tools have this logic built in — HubSpot has Lifecycle Stage parameter which updates across all contacts associated with a company. But, this isn’t always consistent across other tools you use. You can resolve this by updating a global Account level trait in Hull based on any associated User’s activity in Processor. This can then be synced across all your tools. // User lifecycle stage is "higher" than Account stage, so update Account stage. However, it can still make sense to set a lead status or similar trait to classify the individual person’s engagement with your brand. For instance, if one person in a company is (only) a newsletter subscriber, but not assigned to a sales opportunity that’s being actively worked. It is someone’s job to follow up with leads from marketing (and go after new ones). Sales reps holding quota will have an expectation. The lead “pile up” where lead generation is overwhelming what sales can process. This indicates a healthy top-of-funnel. But sales might hate them. Generally, we see sales reps don’t trust marketing leads (since they tend to be poorly qualified) until the mid-funnel has been optimized. This gives sales reps a filter (more signal, less noise) and enables them with conversation starters. There’s a big difference between wooly personas and the data-driven definitions of ideal customer profiles. We don’t see a single customer on Hull that hasn’t carefully defined this, because it is this definition which defines what data you need to profile on your leads, and which leads are synced through to sales. 20X (2000%) increase in marketing-sourced qualified leads with content to match segments. Test drive Hull with our 14 day free trial - and see how to unify & sync all your tools, teams & data (like we did for all these companies), or book a demo with a product expert. If you'd like to learn our best practice for customer data integration, read our free Guide to Getting Started with Customer Data Integration. If you enjoyed this article, perhaps your team will too? Why not share it with the links below.